Even at its early stage Formula Fusion is fast frantic and fun, everything an anti-gravity racer should be. How does it stand up to Wipeout Omega Collection? Read on and find out! And they’re off! Speeding down the track as the engines hum to life, blazing their way into the first corner, ships ramming up against one another while vying for first place on this perilous track. That is, everyone except myself. I assumed that I’d been put in this beautifully designed craft by accident, seeing as I didn’t have the slightest idea what I was doing. Rather than being taught how to use this machine, I was instead left sitting on the starting line without any idea how I got here. The other professional racers were well into the third sweeping turn by the time I got my engines working and I shot off after them, cursing the designer of the ship and praying for a manual as I finally began the race. By the end of the first race I had given up on waiting for a tutorial to appear and instead went searching for the controls in the options menu. However, even without knowing all the controls I was already winning every race I entered in the FF4000 speed class – the lowest of the five speed classes, ranging from FF4000 to FF1000 then to Elite – and chose a race event from the event selection that also included: time trails, endurance racer where your health ticks down and elimination races were after each lap the last player is eliminated. It took me moving up to the next speed class, FF3000, to realise that FF4000 was very much the tutorial for Formula Fusion. Now that I was in the higher ranks, the game came to life. The initial shock of how much faster the new challenge had sent me careening into the walls of the track, before I regained my composure and fought my way over to the other opponents. Racing around the track was a breeze at this point and I found myself transfixed by how the ship and the track worked in unison. In stark contrast to the games I played before, this felt like how Formula Fusion was meant to be played: alive, fast, and frantic. A race over ‘Fiyah! Fury.’ Which is the actual name of the track. R8 Games set out to create the ‘Next-Gen Anti-Gravity Racing Game’, as touted on their Kickstarter page, which received over double the funding they asked for, and I am inclined to agree with them. 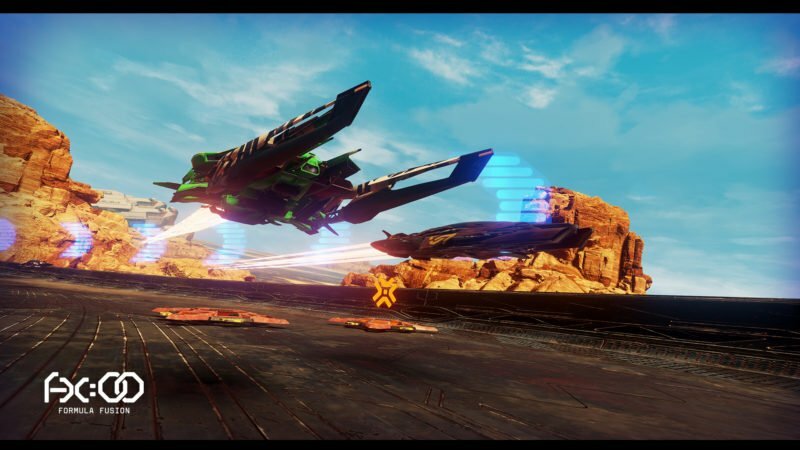 While players are now spoiled for choice with games such as Redout and Wipeout Omega Collection, Formula Fusion has definitely hit its mark. 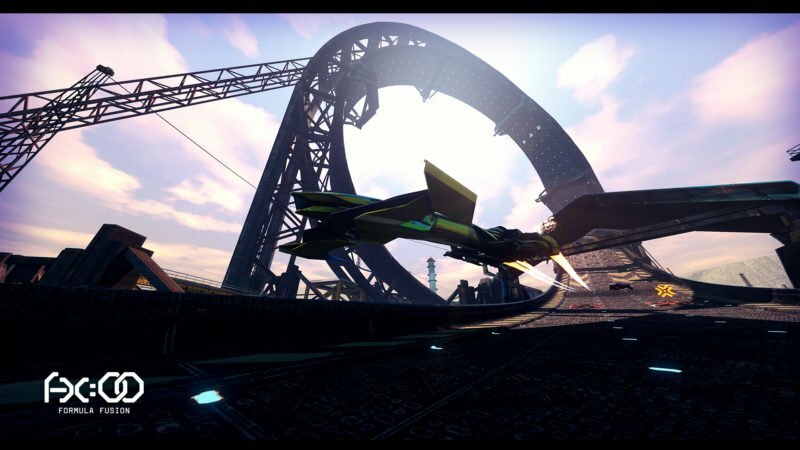 The team of R8, many of whom have worked on the Wipeout series before, successfully brought back the feeling of playing the anti-gravity racers of old. However, the graphics are anything but old, with the game being hosted on the Unreal Engine 4. To put it simply, Formula Fusion looks incredible. 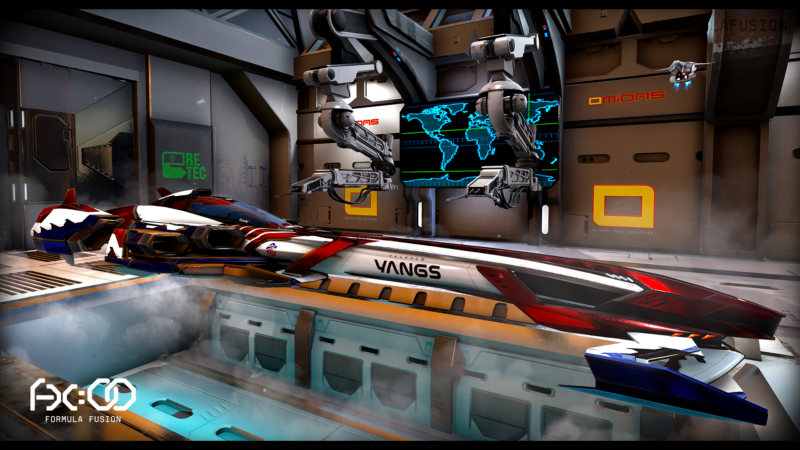 The advanced design of the ships and the sleek look of the tracks perfectly complements the futuristic aesthetic, with the ships still looking impressive even when the world is swept into a blur at breakneck speeds. 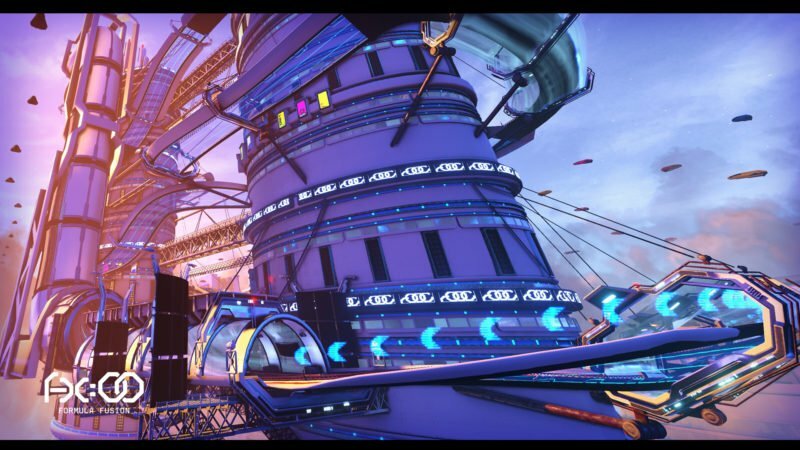 Each new track in Formula Fusion has its own feel and theme which provides each level with its own personality and for a game set in the desolate far future, it is particularly vibrant and colourful. However, it wasn’t just the bright colours that drew me in, but also the variety within the tracks themselves: the mixes between light, dark, new, and old brought the tracks to life on the screen. However, the soundtrack to Formula Fusion does not share the same vibrant design as its visual counterparts. Accompanying you around the tracks is some rather generic techno music which feels like nothing more than dull background music, rather than a song specially chosen to immerse you in the racing experience. While I was playing the game, I chose to put on my own music, maintaining the techno aesthetic but choosing instead more rousing sounds to pump up adrenaline. Piloting the ships themselves does take some time getting used to, but once you have mastered one ship you’ve practically mastered them all. The main problem in Formula Fusion comes from the vast array of controls at your disposal. The controls are designed to test your ability to drive under pressure and at your disposal are two different ways of turning. The first is your standard WASD turning, which does the brute force of the work using the ships thrusters, throwing the back of the ship out, while the other is a system of airbrakes, controlled by the arrow keys, that provide control over the front of the ship while also slowing the craft. The challenge stems from trying to master using these systems symbiotically, as both are required for optimum piloting skills. While there have been several complaints about this design choice on the Steam page, I personally believe that it’s the better decision, as the limiting factor for players becomes their skill level rather than the game itself holding them back. Ultimately, this shows Formula Fusion’s impressively high skill ceiling. Admittedly, it’s not too difficult to win races once you know what you’re doing, and it’s easy to stay in first place so long as you don’t lose control of your craft. While keeping yourself alive and staying at the top of your game can become more and more difficult with the more speed you have at your disposal, I found myself disappointed by the lack of challenging AI. Much like Mario Kart, the fun is found in the middle of the race where you are fighting for first place. The addition of boost in Formula Fusion makes jumping to pole position always within reach. Although the rush of speed you get is enjoyable when speeding down the track, it ultimately makes the game feel too easy. When you are ahead of your opponents it is easy to forget you are playing with other people, as without split times to keep track of you and your opponents you can forget they are even there. As Formula Fusion is still in early access the boost was recently tweaked to be punchier, making it feel like you are actually using it, which was previously a concern when first playing. This means that the difficulty is very likely to change as the game development progresses. Furthermore, players in Formula Fusion have the option to customise their ships through cards within the garage, with each card tweaking the ship’s systems to have them fit more to your style of play. However, in the current build, the effect of these upgrade cards has become useless, as other than bars going up or down there is no explanation as to what they do, leaving you guessing and hoping that each choice will be the correct one. In the garage, players are also able to choose between three currently available weapons, all of which provide different play styles for the more combat and endurance focused races, with a slew of modifiers to make your choice really your own. This, I felt, was the best implementation of the upgrade cards, as each one told you with enough clarity what it was going to do, and there was a wide breadth to choose from, more than any other system choice. It’s a shame that the weapons are often the most underused category, as when you’re in first place there’s no-one around to use them on. Overall, akin to the different ships themselves, there is little change between one upgrade and the next, meaning that players end up with a lack of variation in the ships themselves. While this could be subject to change, the current build is lacking and it takes away from the immersion of the game. There is no doubt in my mind that Formula Fusion is a fun game, and when it gets going it becomes an adrenaline pumping anti-gravity racer that rivals the best of them. While it takes time getting used to the controls and the feel of the game, it pays off when you find yourself rewarded with almost seamless racing and intense lap times to beat. While at the moment the game lacks the depth to keep the player truly engaged, with only one tournament and little variation between ship to ship, what it does have shows great promise for future builds of the game. 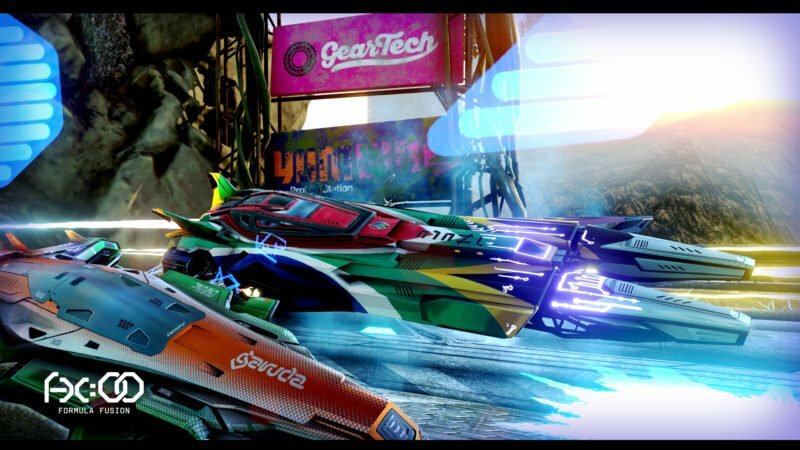 A compelling anti-gravity racer that does not hold you back, however, Formula Fusion lacks the depth to keep players engaged for a long time. The time had with Formula Fusion however will be pure unadulterated racing fun. Alex has come a long way from the days of playing Tomb Raider 2 in a shed as a child. Now playing games in a much fancier shed that he calls a "house".